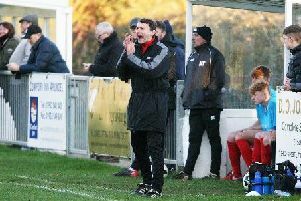 Matt Evans has been relieved of his duties as Worthing United manager with immediate effect following five and half years at the club. The club tweeted: "Worthing United FC has taken the difficult decision to relieve First Team manager Matt Evans from his duties with immediate effect. We would like to take this opportunity to thank Matt for his hard work and dedication over the last four seasons as a manager at the club. "During his time in charge, ‘Mev’ has worked tirelessly to bring success to the club, but with relegation last season & one league win so far this season, we feel it is the right time to change. Matt is extremely well thought of at the club & is a very likeable character. "We are disappointed that things haven’t worked out. The club will now look to advertise for a replacement, and details will be announced in due course. Again, our sincere thanks, Matt." He tweeted: "After 5 and a half years at @WorthingUtdFC I’m sad to say my time at the club has come to an end. From 1st Team Coach to U21 Manager to 1st Team Manager, I have given everything to try and make the club better on and off the pitch but ultimately it’s the results that count. "Thanks to everyone for your support over the years, through the good times and the really tough times. The club will always hold a special place in my heart but for now it’s time to reflect and ensure that I come back even stronger. "I wish the club and the particularly the talented young players at the club all the very best." Worthing United lost 8-1 to Bexhill United on Saturday, leaving the club second from bottom in the SCFL Division 1 table. The Mavericks are at home to Wick on Tuesday night before hosting SCFL Division 1 leaders AFC Varndeanians on Saturday.